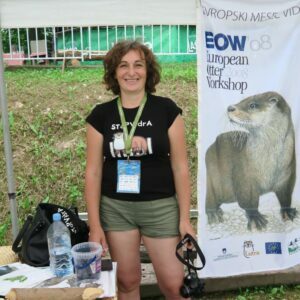 If the Institute Lutra has four corners, a pure-bred “Prlečka” Tatjana supports five of them. As straight-out otter she finds herself well in water and on the ground, looking spraints and measure crabs, between documents and computers, behind the wheel or on a bicycle. She needs at least two computers at the same time, sincer the finances are her stronger side. Being a head office is just one of her complex duties: assigning work to colleagues (but most of it she does alone), taking care of mail, preparing offers and does the lion share of tasks. If necessary, she cooks, drives, is a model for Lutra products and much more. Her friends are beavers who gnaw and pull down bigger and bigger trees along the Mura and demonstrate how to build a sustainable dams. So that the biodiversity of the river is increasing and not decreasing.